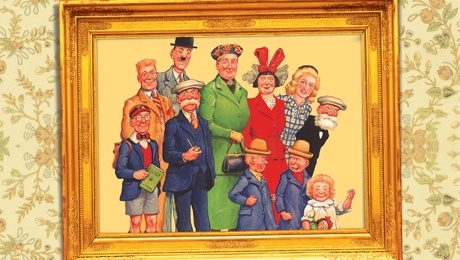 Scotland’s most famous fictional family The Broons are coming to Glasgow’s Theatre Royal this November! Scotland’s most famous fictional family The Broons have been brought to life and are coming to the Theatre Royal in Glasgow from November 7th – 14th 2016! The Glebe Street bunch have featured in the classic DC Thompson comic strips in the Sunday Post since 1936 and this production celebrates them on their 80th anniversary! Award-winning Scottish playwright Rob Drummond brings the infamous characters Granpaw, Paw and Maw Broon, Hen and Joe, Daphne, Maggie, Horace, the twins and the bairn to life for a Scottish audience in a production filled with laughs, love and comic-strip visuals, all set to a Scottish soundtrack. The marvellous artwork and well observed storylines of The Broons means that everyone recognises a little of themselves in these classic tales. We are thrilled honouring these much-loved characters and bringing them to life on stage.